I found it on the Internet! Funny that in the same week I found two websites that profiled and/or incorporated my comments into an article; actually, I didn’t find them myself. A friend saw my profile on iamkoreanamerican.com (they requested my participation so I submitted a profile, but was not notified that it was approved and posted!) and the St Kate PR folks found an article from Sept 23, 2009 that quoted me (from a questionnaire I filled out a couple months ago for the publisher, Lee & Low). 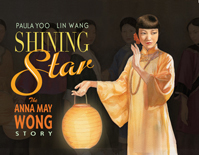 Paula Yoo’s Shining Star: The Anna May Wong Story is an important contribution to children’s literature (not just Asian American children’s literature) because it debunks the simplistic notion that Anna May Wong was nothing more than an Asian fetish for the white American male. Paula writes about the anxiety and discomfort that Anna May Wong experienced as a minority actress in a majority white environment — an environment that continues to misrepresent and exploit the work and talents of Asian American performers. Asian women are often sexually exploited and Asian men are made effeminate and impotent; hardly desirable roles in mainstream media. Anyway, Anna May Wong may have started out in roles that were less than ideal, but as she progressed in her career she was able to be pickier about how she chose to represent the Asian diaspora. The goal of the iamkoreanamerican.com project is to “compile a collection of profiles that showcase the diversity and many interesting personalities of the Korean American population. We hope that our collective efforts will provide a snapshot of the Korean American community at this point in our history.” It’s been really neat to read about so many different Korean Americans in different places, and also to think about how the intersection of our identities and experiences have all brought us to this website. All that to say YAY for raising awareness about Asian American children’s books that raise awareness about important Asian Americans, and for projects that interrogate and showcase the complexity of the Korean diaspora! The Universities of Alabama’s School of Library and Information Studies is pleased to announce the National 3rd Annual Celebration of Latino Children’s Literature Conference: Connecting Cultures & Celebrating Cuentos to be held in Tuscaloosa, AL on April 23-24, 2010. This exclusive conference was created for the purpose of promoting high-quality children’s literature about the Latino cultures and to offer a forum for librarians, educators, researchers, and students to openly discuss strategies for meeting the informational, educational, and literacy needs of Latino children and their families. Featuring nationally-acclaimed Latino literacy scholars and award-winning Latin@ authors and illustrators of children’s books, this Connecting Cultures & Celebrating Cuentos conference is truly an unforgettable experience. REQUEST FOR PROPOSALS: In keeping with the idea of celebrating Latino children’s literature and creating intercultural connections, we invite poster and program proposals that contribute to and extend existing knowledge in the following areas: Latino children’s literature, bilingual education, Latino family involvement in the school curriculum, Latino cultural literacy, library services to Latino children and their families, literacy programs utilizing Latino children’s literature, educational needs of Latino children, educational opportunities and collaborations with El día de los niños/El día de los libros (Children’s Day/Book Day), Latino children’s responses to culturally-responsive literature, social influences of children’s media on Latino youth, and other related topics. Presentations and posters can share recent research or provide practical suggestions for current or preservice librarians and educators. The deadline for proposal submissions is February 19th, 2010 with notification of acceptance by February 28th, 2010. Conference registration begins January 2010. Additional conference information will be available at that time via the conference website: http://www.slis.ua.edu/latinoliteracy1.html. If you need additional information about the conference, I’ve attached our preliminary save-the-date card and you can also contact me at jcnaidoo@slis.ua.edu. I just googled “Korean folk tales” and one of my class projects showed up! In a history of children’s literature course, I wrote an essay comparing Tales of a Korean Grandmother (1947) with Berta Metzger’s Tales Told in Korea (1932), and I created the above website for a folklore class, both in my first semester as a doctoral student. I’ve since learned of earlier folk tale collections; for example, Horace Allen’s Korean Tales (1904) and William Elliot Griffis’ Korean Fairy Tales (1911). I smell another research project!! Legal reforms established during the suspension will prevent problems in the future… the door to adoptions slammed shut in 2007 when authorities discovered evidence of fraud that has since been revealed to include false paperwork, fake birth certificates, women coerced into giving up their children and even baby theft. At least 25 cases resulted in criminal charges against doctors, lawyers, mothers and civil registrars. Really? It’ll be interesting to see how this unfolds. Correct me if I’m wrong, but the NYTimes surveyed adult adoptees, not children. They do grow up, you know. Yet abandoned babies are still carried off overseas in search of families that want them. These phrases suggest that it is the adoptees who look for families, and not the other way around, when in fact the continuing demand from the US and other countries pressures Korea to make sure it provides the supply. 90% of the children sent away for adoption are born of single mothers; they already have a family, but are torn from it so that another family can be created. Words matter. Like I said, it’s great that there’s increasing coverage, but reporters should be careful of how they construct their sentences.